Shop Locally at a Winter Farmer’s Market! Climb to the Clouds to Return in 2020! One of the best aspects of writing for The Laker is that the assignments take me out of my comfort zone. Things were no different this time, when my editor asked me to do a piece on fishing guides. As many readers are aware, a fishing guide is a person who shows, helps, and/or teaches people how to fish. My first and only exposure to fishing, or angling, occurred more than six decades ago when, as a nine year old grammar school student, a friend convinced me to give the sport a try. The experience consisted of using a drop line while standing on the end of a dock in my hometown of New London, Connecticut. After what seemed like an eternity, I landed a small, very boney fish called a conner. My victory was short-lived, as a seagull immediately swooped down, snatched my prize, and left a small deposit on my brand new Keds. This undistinguished experience aside, the American Sportfishing Association (ASA) tells us that, last year, an estimated 49 million people in the United States engaged in recreational fishing. This makes fishing in freshwater the second leading form of outdoor recreation in the country, trailing only various forms of walking, jogging, or running. According to the ASA, recreational fishing had a $115 billion impact on the nation’s economy, and generated more than $15 billion in state and federal taxes. Close to home, more than 165,000 people purchased New Hampshire freshwater fishing licenses during 2018. Sixty-four percent of these were in-state residents, who paid $45.00 for the privilege of fishing for the 57 species of resident fish that inhabit New Hampshire’s rivers, streams, lakes, and ponds. Meanwhile, out-of-state residents paid $63.00 each for licenses. While I am not a fisherman, I do not need convincing about the important role played by well-trained freshwater fishing guides. It doesn’t take a genius to understand that, with so many recreational fishermen out there, conditions are rife for both good and bad behavior. Years ago, I experienced the latter up close as a tourism management consultant in the state of Alaska. While evaluating tourism potential in Quinhagak, a village of approximately 600, (mostly Yup’ik people) situated along the Bering Sea coast, some of the community’s elders exhibited enmity toward me. I soon learned why. Several years earlier, a small company had obtained permission to conduct sportfishing camps a few miles upstream, on the bank of the Kanektok River—the village’s sole source of drinking water. Apparently, the village’s directive to avoid dumping bodily waste into the river was ignored. As a result, there was a health concern. In order to get a grasp of freshwater fish guiding in New Hampshire, I decided to take two steps. First, I sought out New Hampshire Fish and Game (NHF&G), guardian of the state’s fish, wildlife, and marine resources. From NHF&G, I learned that 87 residents paid a $100 guide’s licensing fee during 2018, while 12 non-residents also became licensed guides. I also learned that New Hampshire’s freshwater guides offer a wide range of fishing techniques. These include watercraft (boats, canoes, and kayaks) and ice fishing, trolling (i.e., tailing a baited line behind a moving boat), bass fishing, and the most popular of all—fly fishing. My next step was to seek out a licensed fishing guide to provide a first-hand explanation of the services that are provided. It was my good fortune to be directed to Tim Moore, owner and guide at Tim Moore Outdoors, LLC. After growing up in Portsmouth, Moore followed his childhood dream to become a fishing guide by filling out a state application form, passing a 50-question written examination, and paying the $100 licensing fee. Things are not quite that simple. The state requires that its fishing guides be at least 18 years of age, hold both a guide and a freshwater fishing license, and have a spotless Fish and Game background, with no criminal record. All fishing guides must be certified in both CPR and first aid. According to RSA 207:1 XIII, the guide’s license allows her/him to direct, aid, assist, or instruct other persons in taking wildlife within the state; it also permits the guide to charge a fee for services. Moore’s guide service differs from that of the majority of his counterparts. 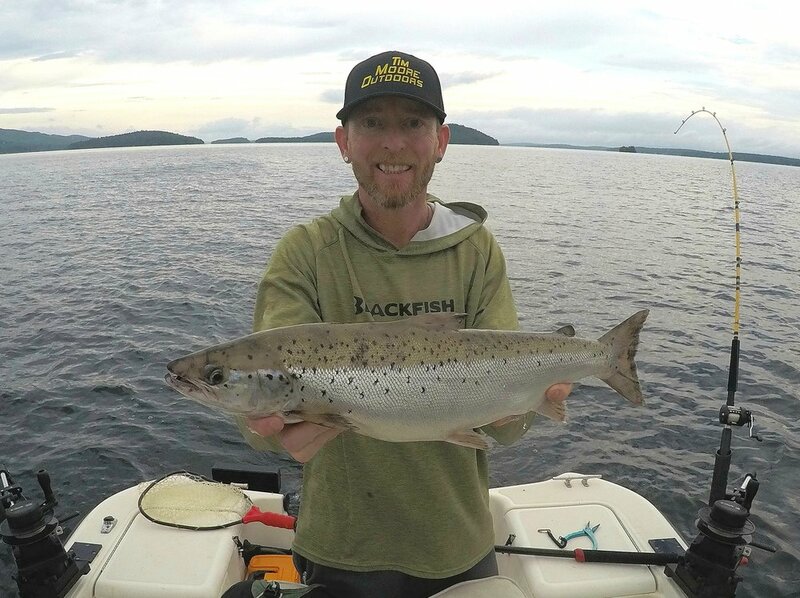 While most fishing guides operate only during open water conditions, he offers year-round fishing charters within the Lakes Region. According to his company website, Moore leads fully-guided ice fishing trips on Lake Winnipesaukee; kayak trips for striped bass, northern pike, largemouth and smallmouth bass, trout, and other species; and freshwater trips by boat for landlocked salmon on Lake Winnipesaukee, lake trout, northern pike, crappy, and bass. I asked Moore to talk about what services are typically provided by a licensed guiding service. He told me that guides are on the water almost every day in order to maintain a store of local knowledge, which consists of keeping up with what the fish are doing and where they are going. In this way, a guide knows the waters and where to fish safely and as successfully as possible. Naturally, guides are experienced anglers. They know the best equipment and which bait to select for a particular species of fish under specific conditions. As a member of the New Hampshire Guides Association, Moore keeps up with information he may need to provide his clients with an optimal experience. Asked what clients are expected to provide while fishing with a freshwater guide, Moore says he requires his clients to arrive with a current fishing license, their own food and beverages, and proper clothing for the conditions. I was interested in the minimum and maximum party size for his services. “It’s not unusual to provide guide services to one-person parties.” For those who want to fish from a boat, Moore has a 17½ foot center-console craft that seats two adults. His largest parties are for ice fishing occasions, when he has accommodated as many as 24 fishermen. Moore is frequently called upon to teach people how to bait a hook, fish, and to assist them in cleaning their catch. These necessities aside, I was curious about what constitutes an ideal guided experience. Moore described the optimum experience as one that provides good fishing, comfort, customer service, good weather—ideally, cloudy with light winds—and great conversation. Unfortunately, this is one factor that Moore cannot control. Apparently, you can lead a fisherman to water, but you can’t make him think. I wondered what other factors can produce an unhappy experience. “Sometimes people in a fishing party just don’t like one another.” Another potential problem—one similar to that experienced by Arctic wildlife guides—is unrealistic expectations. Anglers arrive anticipating a large haul of fish. “They’ve paid good money to hire a professional fishing guide and expect amazing results.” Most people realize that conditions can be unpredictable, but not everyone is understanding. Tim Moore, owner and guide at Tim Moore Outdoors during Kayak University on Squam Lake. In fact, Moore enjoys kayak fishing so much that his company, Tim Moore Outdoors LLC, offers an annual Kayak University at Cottage Place on Squam Lake. This year, Kayak University will be held from May 31 through June 2. The event brings together professional kayak anglers and people interested in this type of fishing. There will be seminars, opportunities to fish together for a day and a half, and plenty of time to socialize. After talking with the people at New Hampshire Fish and Game as well as Tim Moore, I feel confident that the state’s lakes, ponds, rivers, and streams and the future of freshwater fishing are in very good hands. For additional information, NHF&G’s main telephone number is 603-271-3421. Moore can be reached by telephone at 603-842-3572, or by email at tim@timmooreoutdoors.com.